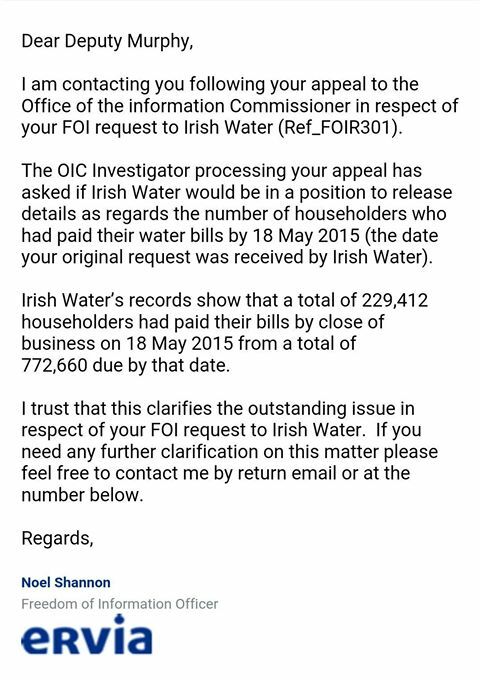 It has taken 5 months for Paul Murphy to finally get an answer to his Freedom of Information request on 18th May, 2015, concerning the number of household that paid Irish Water's first bill. See thejournal.ie article of May 28th, 2015 'Irish Water thinks it’s better you don’t know how many bills have been paid' for full story of Paul Murphy's effort to get a simple question answered. "Remember when Enda Kenny refused to give us the payment levels and told us to "toddle along" to Irish Water? Remember when they refused to answer as well? Remember that then they refused an FOI request? Remember a question to Minister Alan Kelly about it was ruled out of order for no good reason by the Ceann Comhairle? Now we know why.... Five months later, after an appeal, we have the figures from Irish Water for payment levels on 18 May. 30% payment - 70% non-payment. No wonder they wouldn't tell us, they had to try to bully some more into paying. Now, what journalists and others should be asking is, why haven't they released the payment levels for the second bill? Instead of doing that, they have talked about "projected" levels of payment. They don't need to do any projecting - just tell us how many have paid the second bill." Mr Murphy explained on the same page that the letter was signed Ervia because "Ervia is state owned, Irish Water is a subsidiary of it. That's why they signed off on the letter."